Well, me basing Carl Froch’s ‘probable’ loss on his last three performances was a big mistake, no, a HUGE one! Froch’s performance not only defied the experts, it defied the Froch of late. Froch didn’t just take command of last nights show before a packed Nottingham Venue, it would have sent the Sherriff himself running, as Robin Hood in the guise of Carl Froch, stole Bute’s title, the bookie’s money and the critic’s score! The first round opened in the usual fashion, two top lads feeling out one another for a chance and a way to move in, score and break the other man down. The first half of the round was like this, but it finished with some good exchanges, Froch the busier and more aggressive, though Bute got him a nice one. 10 -9 Froch. 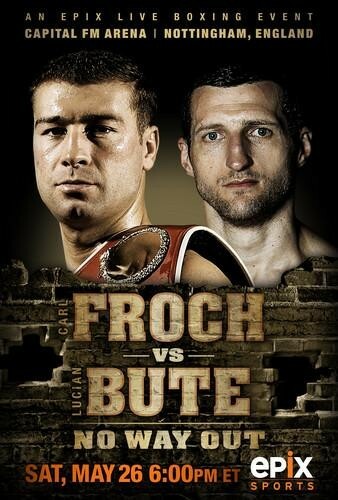 The second round was more of the latter half of the first, with both fighters landing, Bute catching Froch coming in, and though I have no doubt Froch offered him respect, “you could see it,” Bute just didn’t penetrate enough. Back and forth exchanges, and one wouldn’t have been faulted in calling it an even round, I gave it to Froch as a matter of a continuation of the same as in the end of the first round, 10-9 Froch.